Well, hello there! Cora here! And if you are reading this post on Cora Cooks, it means I have been successful in remembering how to blog! So many things have happened over the last three+ years that have kept me from blogging -- some good and some not so good. Those are stories for another time. Today I just had to give this a try, mainly because I made this wonderful Shrimp Scampi last night for dinner and took a photo -- and it just felt right! Thanks to Pinterest and many, many busier bloggers, I was able to find several good Scampi recipes for inspiration yesterday and then create one of my own from Damn Delicious. It was our Super Bowl Shrimp Scampi. Some things never change though, there are lots of notes-to-self in my recipe that seem to border on too-much-information. What can I say? It is what works for me, after so many years of cooking and mostly winging it. I cook without recipes, but occasionally need to write up the finer points in copious notes. That is what happened last night. This was so good, I took a photo, wrote it down, -- and here we go again! I will have to say up front I used giant Royal Red shrimp for my Scampi and that may have created most of the satisfying magic ... but then there was the butter ... and the wine ... and the lemon ... and the red pepper flakes ... so who knows, maybe it is just new Studio kitchen magic. Yeah, that is right! I've got a giant new Studio where the magic happens for my cooking classes. But it is truly a totally creative space for everyone -- a friend's quilting group, luncheons for bridge groups, cooking parties, and all kinds of other craftiness -- my own sewing, knitting, jewelry making, etc. -- and now, I guess, my blogging too! We will just have to see if I can keep up. Full disclosure time though. If I had planned to share this recipe, I would have made it during the daytime, to take advantage of all the natural light I had built into the Studio kitchen! Now I need to take advantage and cook earlier in the day. The Shrimp Scampi was not even planned for dinner. My blog, after all these years, is still a work in progress. The Index and Print links need some serious attention. But first, I will require some self-teaching moments to become familiar with all that has happened while I've been otherwise occupied -- creatively speaking. So bear with me. Please come back again. I want to share photos of my Studio -- but while you wait, maybe try the Scampi! 1. Prep all ingredients – this goes quickly! Cook spaghetti, drain and hold in covered pot with small amount of cooking water. Rinse shrimp and dry with paper towels. Sprinkle lightly with sea salt and pepper. 2. Heat large skillet on medium; add olive oil and sauté shrimp, turning once until cooked through and color just turns to opaque white – Do Not Overcook! Remove cooked shrimp to a plate and leave oil in pan to make sauce. 3. 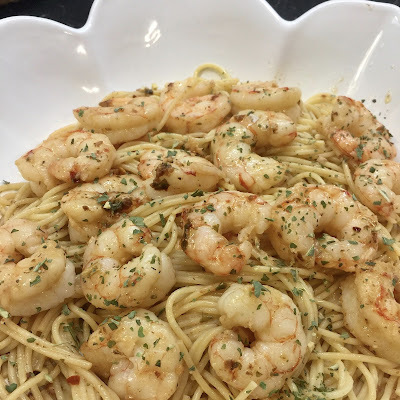 With same skillet on medium-low heat, add ½ of butter to olive oil left from shrimp; add garlic, Italian seasoning, red pepper flakes to skillet and heat for 1-2 minutes – Do Not Let Garlic Brown! 4. Squeeze lemon juice into pan, add white wine and whisk to blend – be sure to taste and adjust seasoning. 5. Add remaining butter; whisk to blend hot mixture. 6. Place cooked spaghetti into skillet; toss with tongs to coat with sauce. Leaving sauce in skillet, lift spaghetti out of pan and place into a large flat bowl. 7. Return shrimp to pan to reheat briefly in warm sauce; pour shrimp and remaining sauce on top of spaghetti. 8. Serve immediately - garnish with parsley or additional Italian herb seasoning and red pepper flakes, freshly grated Parmesan, lemon wedges. *I used extra jumbo Royal Red shrimp – use any size large, extra large, jumbo, or extra jumbo of your favorite shrimp, based on availability and amount needed for number of guests to be served.